A stunning new comic adaptation of Michael Moorcocks classic novels! 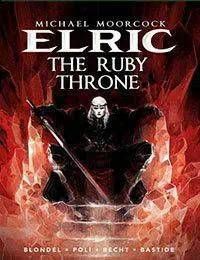 The ancient island of Melniboné has been ruled by Elric, the albino Emperor, for millenia. Reliant on magic and herbs for his strength and prolonged life, Elrics grip on Melniboné is crumbling, as his people slide into decadence. Now his envious cousin Yyrkoon, Prince of Melniboné, plots to overthrow him and claim the Ruby Throne for himself!